I’m totally obsessed by this silicone coffee cup, which collapses and changes size like a toy. The first time I saw one on the subway, I stared at it, mesmerized. Like the geeky architects who collect hundreds of different coffee lids, I couldn’t let it get away. So I made the cool person sipping from it unplug her headphones and tell me all about it. She told me it’s portable, refillable, colorful and never leaks. When she’s finished, she just collapses the sides, sticks the lined ring inside the bottom and tosses the empty flattened puck in her purse. “Good for you, saving the earth one paper cup at a time,” said a man near us, eavesdropping. Perhaps, he, like me, had just read this article in the Climate Fwd: Newsletter from The New York Times, which suggests multiple ways to brew a greener cup of coffee to reduce climate impact. Not surprisingly, single-use cups generate a lot of waste when tossed daily. 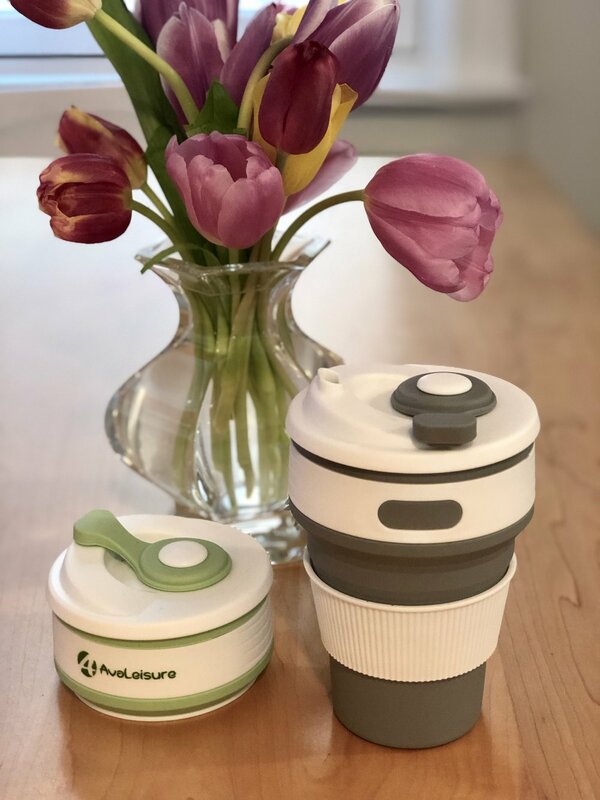 A convenient refillable mug is a great green step . The happy, helpful coffee commuter told me to look on Amazon, where I easily found several food-safe, BPA-free brands (here’s one version). I immediately went home and ordered two. One for coffee, one for water. If I ever see her again, we’ll match. In Wes Anderson's fabulous film Isle of Dogs, canines are removed from daily life and banished to a remote island. Here in Manhattan, it's the opposite. We're an Isle of Dogs that has Aisles of Dogs. I've seen pets tucked, lifted, dragged, walked, seated and scooped just about everywhere, including to Starbucks and the movies. Trendy owners now bring fur babies to the office, or even the post office (above). The problem is not all breeds are good walkers. Some tire easily on skinny little legs; others may be heavy as bowling balls. Enter, four wheels. Compared to, say, bringing an emotional support peacock to the airport, doing chores with a bulldog in a baby stroller is a walk in the park. But the sight of a regal dog in a cushy throne always makes me wonder. Who's the real master?